The Pentathlon consists of 2 rounds of Agility, 2 rounds of Jumping, and 1 round of Speedstakes. The combined results from the 5 classes determine the Individual Pentathlon World Champion. One world champion will be declared in each jump height. Scoring is cumulative; faults are added to time, and the lowest score wins in all aspects of the Pentathlon. Each country can enter 3 dogs per jump height. The Biathlon consists of 1 round of Jumping followed by 1 round of Agility. The combined results of the two classes determine the Biathlon World Champion. One world champion will be declared in each jump height. Scoring is cumulative; least faults wins with time as tie breaker only, in all aspects of the Biathlon. Each country can enter 3 dogs per jump height. The Games Championships consists of 1 round of Snooker followed by 1 round of Gamblers. The combined results of the two classes determine the Games World Champion. One world champion will be declared in each jump height. Scoring is cumulative; highest number of points wins with time as tie breaker only, in all aspects of the Games Championship. Each country can enter 3 dogs per jump height. 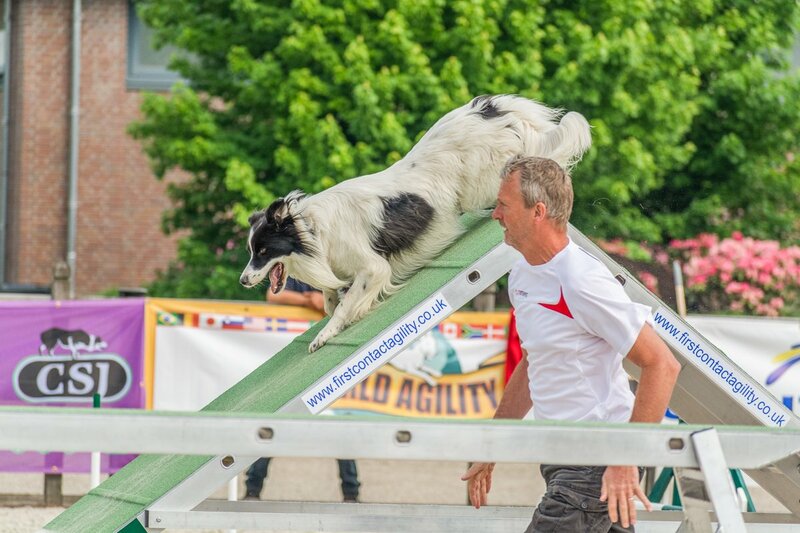 The Team competition consists of 2 rounds of Agility, 2 rounds of Jumping, and 1 round of Speedstakes. The combined results from the 5 classes determine the Team World Champions. Scoring is cumulative; faults are added to time, and the lowest score wins in all aspects of the Pentathlon. The object of this class is to negotiate a full course of agility equipment. There are a minimum of 19 obstacles and a maximum of 20. The object of this class is to negotiate a course without contact equipment. There are a minimum of 19 obstacles and a maximum of 20. The object of this class is to negotiate a Jumping course that also includes an A-frame. There are a minimum of 19 obstacles and a maximum of 20. The object of this class is for 4 dogs and 4 handlers to work together to perform a relay course as a team. There is 1 dog from each jump height on a team. Each dog on the team will perform a minimum of 15 obstacles and a maximum of 20 obstacles with a baton change between each run. The goal of Gamblers is to accumulate as many points as possible within the time allotted by the judge, and then to make a strategic decision to perform one of the two short “gamble” sequences within a specified time period to earn bonus points. The object of the game is to earn as many points as possible within the course time set by the judge. Scoring is similar to the billiards game of Snooker; however, the judge may place the obstacles in the ring in any position.